I write all of the time about teaching kids to cook. I really believe that the foundation to healthy eating is having a good set of cooking skills. Certainly, you don’t need to be a professional chef, but a basic set of skills allow you to cook foods that are healthy rather than relying on processed convenience foods. I always intend to write about children cooking. I’ve never written anything specific about girls cooking, but most of my pictures and stories are about my daughter and I in the kitchen together. Interesting……….since I only have one daughter and three sons. I never intended to write about only teaching girls cooking skills, but I think that is exactly what I did. My husband cooks all of the time and his participation is what allows us to continue to get real food to the table on a regular basis. I want my sons to grow up cooking so that they can be part of the “team real food” for their future families. As the saying goes, ” A woman’s place is in the kitchen”. That is certainly an antiquated sentiment. However, a woman’s place is likely in the kitchen after she gets home from the boardroom. If you want to really make your future son’s wife happy, you can teach your son cooking skills so that he can partner with his wife in the kitchen. And………..have a whole heap of fun in the process. 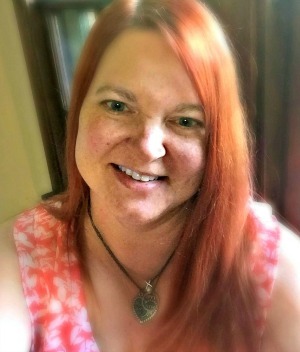 Ok………..off of my modern woman soap box. 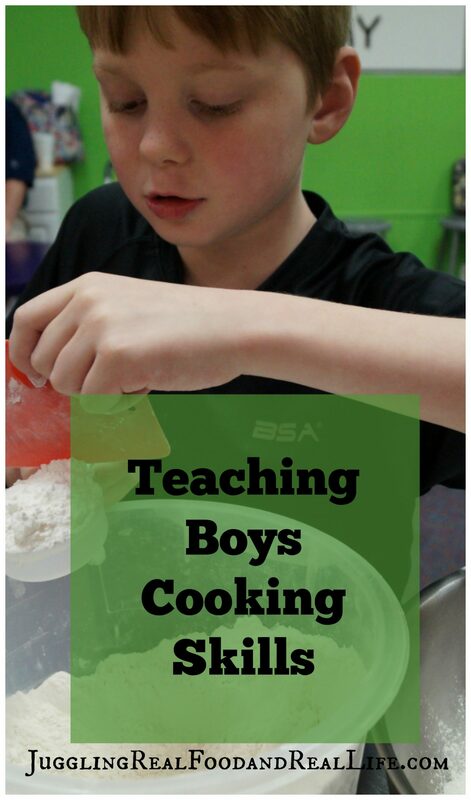 Today, I am going to share 5 tips for getting boys to help out in the kitchen and get them really excited about cooking! Teach kitchen safety rules first. I was surprised when I saw my son grab for the food processor blade like he was grabbing a stick of butter. Luckily, I grabbed his hand before he cut himself. He had no idea that it would be sharp. My bad. Backup and teach the “obvious” to our sons before they start helping in the kitchen. A tour of the kitchen showing everything that is sharp, hot, or pointy. Let them create their own recipe book. Print out or copy written recipes as your son makes the dish. Put in their binder and they have all of their favorite recipes handy. My son is very competitive and loves to keep growing his binder. Science Experiments. Boys love science. Teach them the importance of getting the measurements correct so that their science experiment turns out as planned. Include your son in meal prep wherever possible. Making an entire recipe is fantastic, but if attention spans are short full recipes can feel more like a battle rather than fun in the kitchen. There are plenty of small prep tasks that can be done in a short time. Preparing lettuce for salads, mixing the salad dressing, chopping veggies………endless tasks. 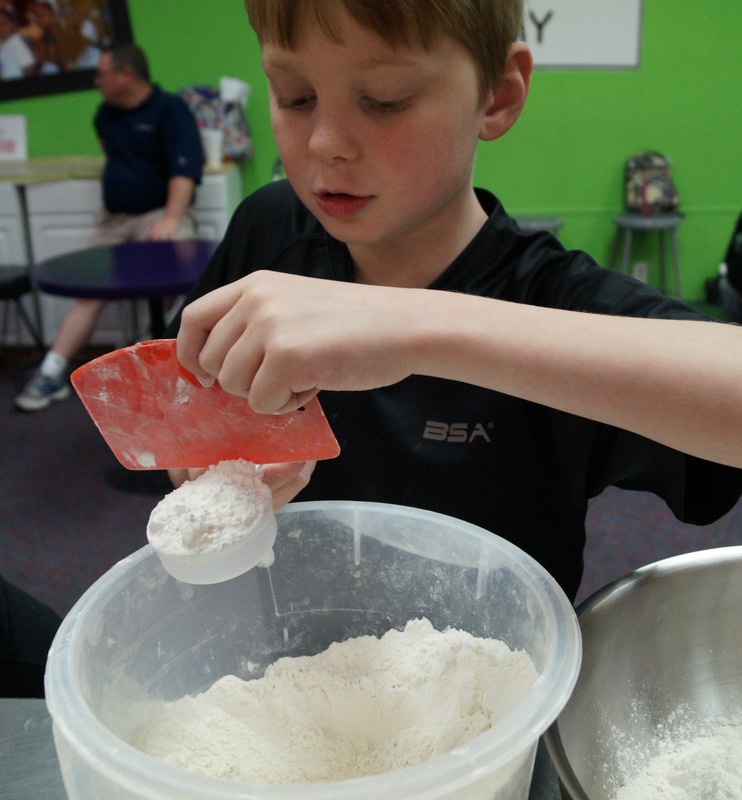 Take the time to teach your son to correctly do the task and he will quickly become a big help in the kitchen. Choose recipes your son will love! 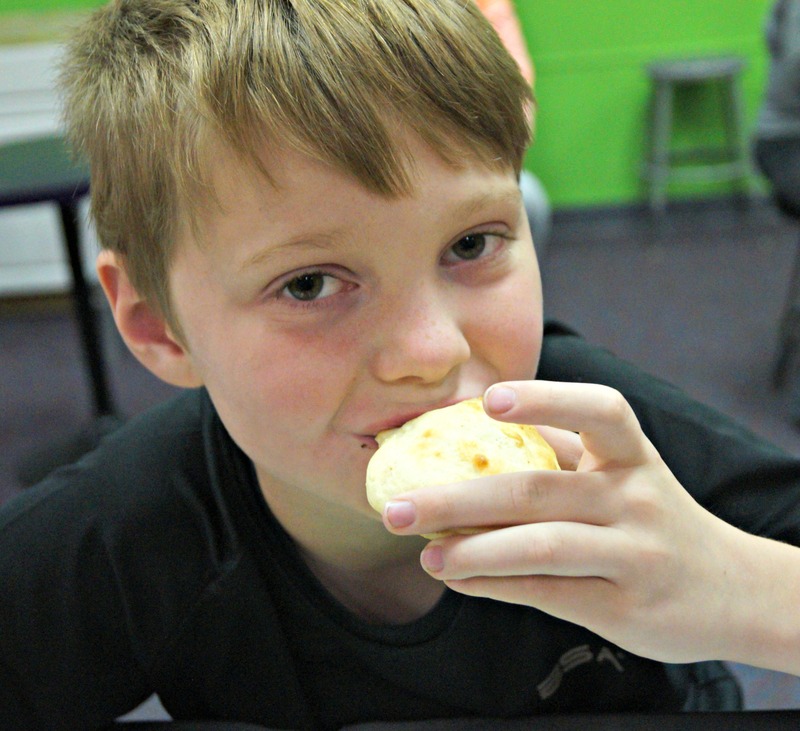 Children typically prefer food that they make themselves. Some say that children will even eat foods they don’t usually care for if they prepare the food. I haven’t found that to be completely true. My non-veggie loving son is no more likely to eat asparagus just because he prepares it. I like to teach about new foods all of the time, but to start with I like to find recipes that I know my son will love. I want him to be excited about cooking and preparing food with love. Sharing his favorite foods is a great way to nurture his excitement. 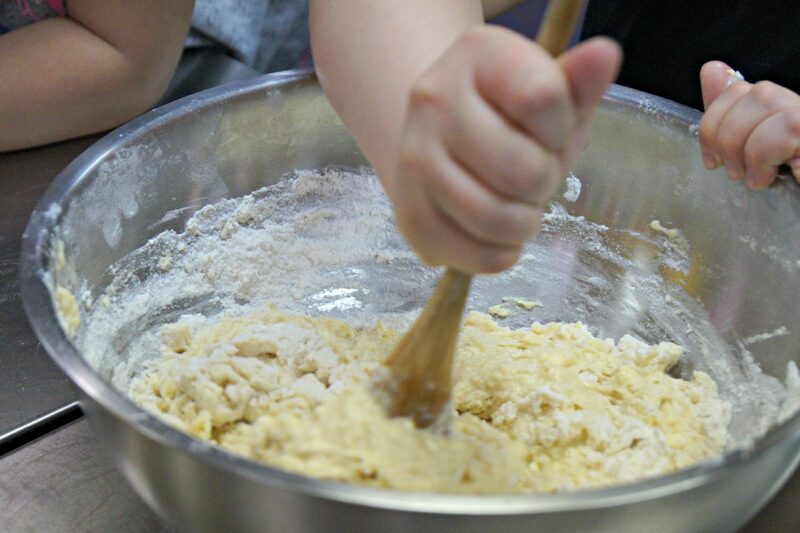 What is your son’s favorite recipe to prepare? If you have boys and girls do you find yourself cooking with your daughters more? Does your son love to cook? 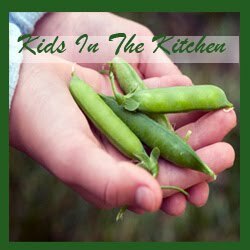 For more tips, recipes, and advice for cooking with kids check out the Kids in the Kitchen section. Just click on the image below. You make an excellent point Winnie!